When we talk about the great grandfolks of the blues, our minds hit on that image: the lonesome guy with a guitar. Those legends of the nineteen-thirties shouted their woes about the lot-of-man down the ages with voices that cross ages and nations. I’ll be the first to admit they’re my link to the blues when I started listening to the 70s rock artists who shamelessly (or gloriously if you prefer) covered their tracks. But these guys were trailing on others’ blazes – the first generation of commercially successful blues artists were women. African-American singers were a big thing in the clubs of the city and the backwater bars of the deep south long before recorded music was. Female singers would tour the towns with their entourage, including sideshows and dance acts as well as singers and their bands. Mamie Smith was a club singer in Harlem for 7 years by the time she cut “Crazy blues” in 1920- a lazy New Orleans-style jazzy lament that paved the way for all the commercial recordings that came after. Mamie’s restrained club-singing was soon outpaced by artists with a raw sound. The public had a taste for the visceral, and Bessie Smith (no relation as far as I’m aware) provided it. Songs like “T’aint nobody’s business if I do,” “I need a little sugar in my bowl,” “Gin house blues” and “On revival day” are all pretty familiar in the blues and swing dance scenes today (or to anyone familiar with Nina Simone’s catalogue recorded some 30-40 years later). Smith’s recordings are melodic, with her gut-driven vocals retaining a crooning quality and a beat that’s often heavily “pregnant” – the piano left-hand lags way behind the vocals to give a light swing on many tracks. Her songs are well covered by later bands, and have the same sorts of themes as you expect from her male blues counterparts: trouble with the partner, trouble with drink and thoughts of lust or violence. I have to admit, I find some of this early aesthetic hard work – you have to get ‘your ear in’ on the old recording quality and five songs in a row about domestic violence is about my limit. But you’ll be missing out on some crackers if you don’t put that effort in. As with the wider body of blues music in general, the early blues ladies aren’t just about battles with mortality or the bottom of the bottle. I’ve recently been working my way down the recordings of Memphis Minnie, who was no less prolific than Bessie Smith. Minnie had been performing with banjo, guitar and voice since before she was ten, but didn’t get to record until 1929. Her style is much more “country”, with bouncy little rhythms and an upbeat tone. Her content tends more toward the raunchy – songs like “Dirty Mother for You,” “Hot stuff,” and “Living the best I can” are all sung with a wink and a nod. “My Butcher Man” is definitely about a meat vendor. Even that sounds dodgy. Minnie recorded and gigged around Chicago with the likes of Big Bill Broonzy, and her recording history is littered with musical partnerships. If you want a silly, joyous, chatty listen, give “New Orleans Stop Time” a go. Her accessible song style led to songs like “What’s the Matter with the Mill” and “When the Levee Breaks” being covered by Muddy Waters and Led Zeppelin (Zeppelin even gave her their rarest of compliments: acknowledging her in their sleeve notes). My final woman of the early blues was a touch later, cutting tracks from the mid-1930s as a young club singer – Lil Green. Green also did an act with Bill Broonzy and her songs have the structure and tone of being more of a pop song. I think of her as ‘Billie Holiday-lite”, as there’s some similarity in the voice but without the full gut wrench that sets your teeth on edge with Holiday. 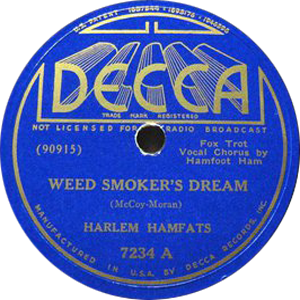 Green’s tracks tend to tread the line between swing and blues, none more so than in the first recording of “Why Don’t You Do Right” since it was re-written from the original Harlem Hamfats song “Weed smokers Dream”. Peggy Lee later claimed that she had Lil Green’s record on constantly in her dressing room, so Benny Goodman decided to do a new arrangement which set its status as a Jazz standard for evermore. But her on-beat catchy tunes are a foot tapper for dance enthusiast and novice alike. So there you have it, a quick whistle-stop of some of my early faves. There’s far more to them all than I can cover, but I thoroughly recommend you wrap your ears around some of their tracks and have a little shuffle ’round your living room. Many thanks to the author Phill Brown.